We fully recognize that JibJab is nothing without the people that come to visit our site and share our work so we wanted to send out a heart-felt thanks and some good New Years wishes from us to you. What better way to let you know who we are then to include our mugs! 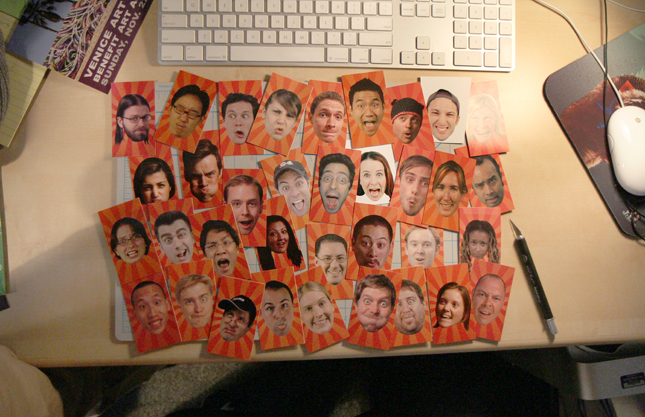 Every JibJab team member has a goofy face on the back of their business cards so, like with the rest of this project, we grabbed the Exacto knife, cut ’em out and slide ’em around on some paper. Here’s 35 of the hardest working people you’ll ever meet! This entry was written by paulhanges and posted on December 27, 2009 at 4:02 pm and filed under 2009 Year in Review. Bookmark the permalink. Follow any comments here with the RSS feed for this post. Trackbacks are closed, but you can post a comment. I reconigze some of you guys from In 2007.